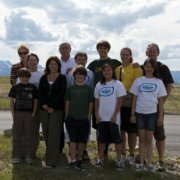 I worked in a variety of locations and on many different projects when I was in Montana. On Monday, I helped Tom Crawford take down some tipis as well as pick peppermint for a ceremonial sweat lodge. I really enjoyed my time with Tom. He offer a lot of insight on the Blackfeet culture. I also spent time assisting in the construction of a wooden horse corral at Pastor Hill’s ranch. That was a fun project that a lot of volunteers were passionate about. I unloaded a 48 ft 18-wheeler full of donations! It was an exhausting day, but the people I worked with were hilarious and kept us laughing. It made the day go by fast. On one of the other days, I spoke with elders at the care center in Browning. It took awhile for some to open up, but once they felt comfortable, they were talkative. Overall, I had a great experience! It’s something I would definitely do again. By far, it is one of the best decisions I’ve made. The community was grateful for our servitude, and it felt good whenever I received their gratitude. I was honestly a bit nervous to make the decision to serve, but Julie (one of Global Volunteers’ Volunteer Coordinators) continued contacting me to see if I wanted more information or kindly reminding me the deadlines for the volunteer dates. A gentle push I needed to finally say yes. That was a decision I’ll never regret and a journey I’ll never forget. Chat online with a Volunteer Coordinator to learn how to become a Montana volunteer.